European art has been strongly influenced by Africa since the last century. S.T. Dupont pays homage to African art with this astonishing Limited Edition, where different patterns of yellow gold, skilfully engraved by S.T. Dupont's craftsmen, makes a strong contrast with the dark inlaid onyx plates. S.T. 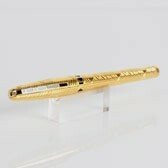 Dupont Afrika Limited Edition is made up of two pocket lighters numbered from 1 to 2000, a table lighter numbered from 1 to 100, a fountain pen and a ball pen each one numbered from 1 to 2000.